A great diversity of mushroom species thrives in the state of Georgia. They include highly poisonous, tree infecting and edible species of fungi. Mushrooms grow and recede depending on weather conditions, often appearing after rains. They can be fun to collect or observe in the wild. No one should ever eat or even taste a wild mushroom without the consultation of a mycologist because some mushrooms cause serious illness and even death in humans and pets. The state of Georgia hosts an amazing array of mushroom species. Some of the fungi benefit plants while others destroy them. Although a few Georgia mushrooms are edible, most are not. Several mushrooms are highly poisonous. No one should eat or even taste a wild mushroom without consulting an expert, preferably with a sample and location information. Because wild mushrooms are challenging to identify, illnesses and even death sometimes occur among humans and pets that eat them. A mycologist or plant pathologist can provide identification of any mushrooms, but they need actual samples rather than photographs to be certain. If you are attempting to identify a mushroom, be prepared to describe to the expert whether the mushrooms or conks have gills, teeth or pores. Describe the specific environment where you found the mushroom and whether it is from a tree or on the ground. Most mushrooms in Georgia are inedible. Georgia hosts a few edible mushroom species. Chanterelles, in particular, are renowned for their taste. They prefer mossy areas around oaks and conifers. Golden chanterelles grow in clusters and have orange and yellow caps with blunt gill edges. Take heed not to confuse chanterelles with jack-o'-lantern mushrooms, which have gills; those cause illness. Meadow mushrooms have white to brown caps that are slightly convex when fully grown. Found in meadows in early autumn, they have crowded gills and cylindrical stalks. Wood ear mushrooms, a type of jelly fungus, have earlike shapes and prefer decayed logs and moist areas. They add texture to soups. Lacquered-shelf fungi are bracket fungi that grow on decaying hardwood trunks. They are popular for medicinal teas. Remember not to eat any wild mushroom unless an expert advises it is safe. Fungal conks grow from weakened or diseased trees. Conks, or fruiting bodies, grow on tree cracks or other damaged areas and display bracket shapes. Brown rot fungi consume cellulose in rotting wood. These fungi flourish in moist wood rather than dry. Parasitic shoestring mushrooms grow on hardwoods and conifers and form dark shoestring-like strands under tree bark. Fusiform rust invades pine trees and forms large galls that produce spores to spread their disease to oak trees as part of their life cycle. One show-stopping fungus is slime mold, particularly “dog vomit” with its vibrant yellow-orange hue and creeping growth. Slime molds can move more than a few feet per day. Some mushrooms exude an odor of putrefaction. Stinkhorn mushrooms aid in decomposing plant material. Octopus stinkhorn stands out in its bright orange color. The dreadful smell of starfish stinkhorn attracts spore-dispersing insects. Boletes grow around the roots of other plants and work the soil, releasing nutrients for the plant. The enormous Macrocybe titans mushroom, recently found in Georgia, is a rare specimen at this latitude, preferring subtropical and tropical regions. The caps of these mushrooms can reach up to 3 feet across. Indigo milkcap displays a deep blue color and when damaged, it “bleeds” indigo blue liquid. The small death angel mushroom displays a striking white cap and stalk with pure white gills underneath the cap. This mushroom and some other Amanita species can lead to death when eaten. Never eat or even taste the small death angel. Other Amanita species include browning amanita, small-to-medium mushrooms with dark brown caps and patches of white. Green-gilled mushrooms display a large convex cap with light brown scales on a thin stalk. The gills turn green as spores mature. Green-gills are highly toxic and should never be eaten. Sickener mushrooms bear a brilliant red cap and thick white stalk with many white, close gills. Do not eat the sickener mushroom as it induces illness. Remember to consult a fungus expert before eating any wild mushroom. Illness or death in humans and animals is possible. Mushrooms contribute to healthy soil ecosystems. 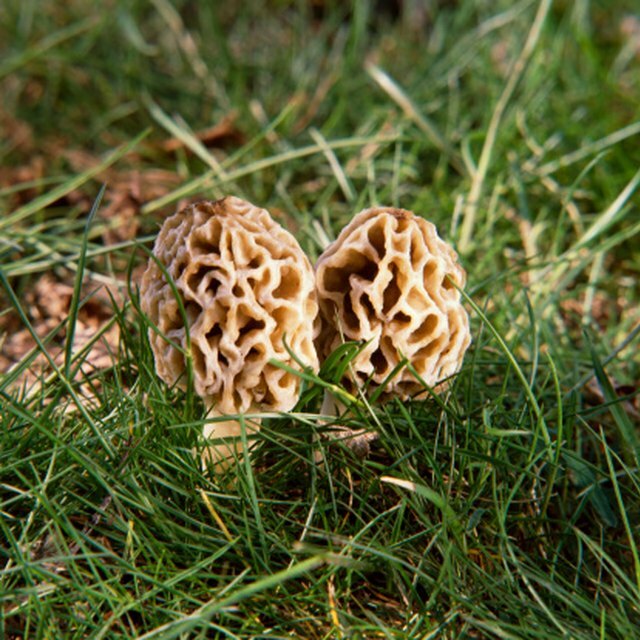 Mushroom hunting can be an enjoyable and educational pastime, as long as you never eat a wild mushroom unless an expert identifies it as safe for consumption. Dianne, J.. "Mushroom Hunting in Georgia." Sciencing, https://sciencing.com/mushroom-hunting-georgia-6821250.html. 07 May 2018.